In the 1970’s when the Republican Party in St Johns County virtually did not exist (compared to the +90,000 who rally behind the banner of the GOP today) Historic City News editor, Michael Gold, was wearing out shoe leather trying to register as many twenty-to-thirty-year old’s possible to provide respite for other conservative local businessmen who already knew that the Democrats were just not going to be able to represent us. To stick an “R” behind your name on a local ballot was virtually the kiss of death. Today the opposite is true. Except in those local elections inside the City of St Augustine, Town of Hastings, City of St Augustine Beach, Judicial elections, Airport Authority seats, or other non-partisan races where it just doesn’t matter. But, at least in Florida, state ethics laws govern how candidates may position their party affiliation in campaign advertising — especially when the race or seat they seek is non-partisan. St Augustine Beach Mayor, Rich O’Brien, has learned that lesson the hard way — agreeing to comply with a Consent Order with the Florida Elections Commission over tactics he employed in his re-election bid last year, and to avoid further litigation and fines. 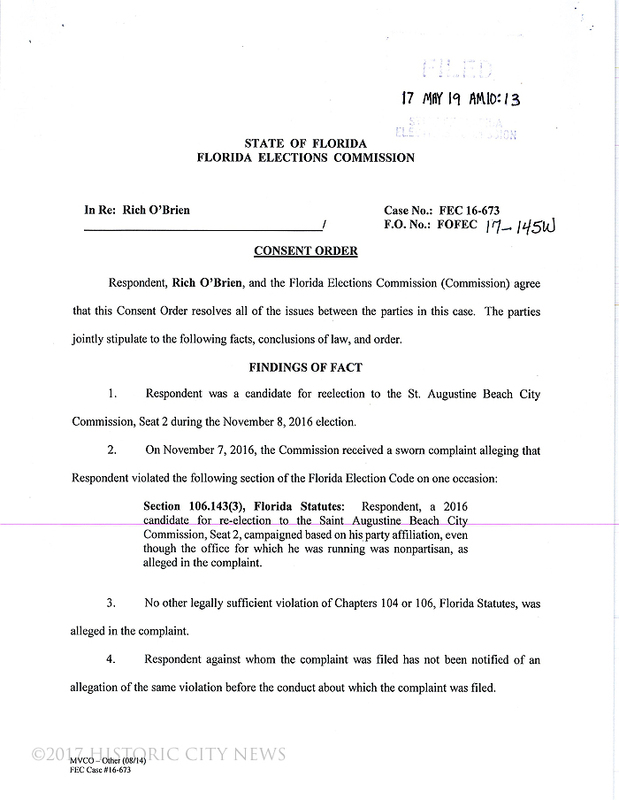 On November 7, 2016, the Commission received a sworn complaint from St Augustine Beach resident, Dr. Michel Pawlowski, alleging that O’Brien violated the Florida Election Code when he circulated a campaign flyer declaring himself as St Johns County’s Republican Choice for office. The seat, of course, is non-partisan. The St Johns County Republican Party in recent years has been at the bottom of inducing straw candidates to declare themselves in partisan races to close local Primary Elections, blocking tens-of-thousands of Democrats and other minor party voters from participating in the choice process for their county commissioners, tax collector, property appraiser, clerk of court and St Johns County Sheriff, according to admissions by current and former politicos who have participated in the process. In the last City of St Augustine mayoral election, Republican operatives assailed the sitting Mayor, Nancy Shaver, as they attempted unsuccessfully, to seat their puppet, radio personality Kris Phillips; who regularly pointed to the fact that she, like O’Brien, had backing of the Republican Party for her non-partisan political seat. In O’Brien’s case, by selecting the “Consent Order” route to disposition, he acknowledged that he did so voluntarily and upon advice of counsel. He also agreed that he would pay his own attorney fees and costs that are in anyway associated with the case. O’Brien voluntarily waived confidentiality as permitted by Section 106.25(7)(c) F.S. upon approval of the Consent Order, and the right to appeal the Consent Order. 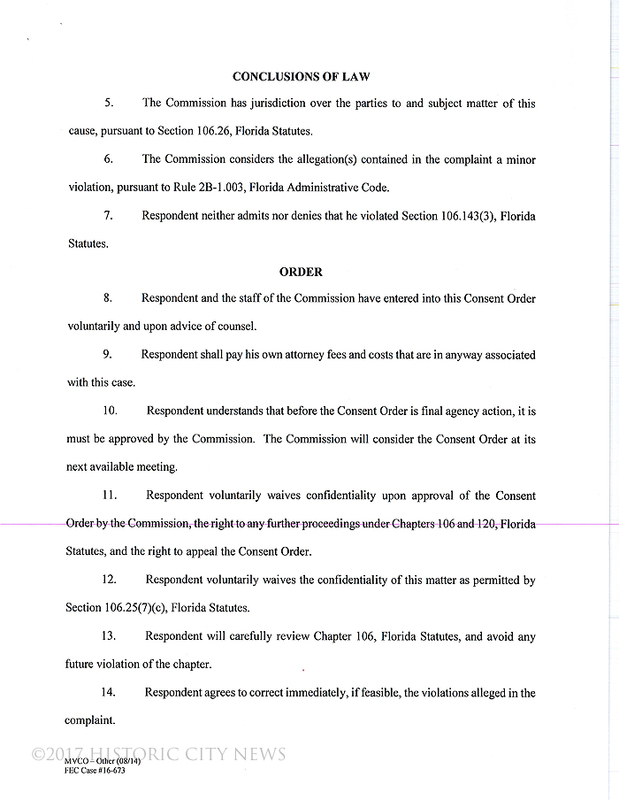 Respondent Rich O’Brien specifically agreed to “carefully review Chapter 106, Florida Statutes” and to avoid any future violation of the chapter. He also agreed to cease and desist immediately the violations alleged in the complaint. 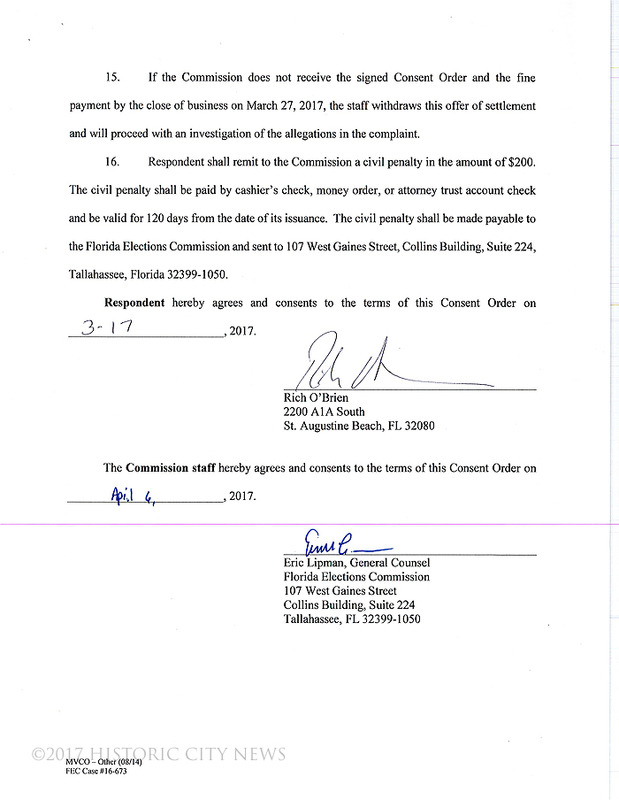 The Commission gave O’Brien until the close of business on March 27, 2017, to conform to all terms of the Order and to remit to the Commission a civil penalty in the amount of $200.00. The Consent Order was made a “final agency action” when the Commission approved its terms during their regular meeting, May 17, 2017.